The Annual Report outlines the functions and activities of NSW Health over the 2017-18 financial year. 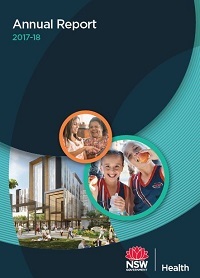 The report includes performance and achievements of all local health districts, specialty networks and other controlled entities that comprise NSW Health. Under the Annual Reports (Departments) Act 1985 the NSW Ministry of Health is required to table the audited financial statements of each controlled entity.